Grains a little weaker this morning. Beans down ¾ cent, corn down 1 ½ cents, and wheat down 2 cents. No new news on U.S./China trade, but more talks will be held in Beijing next week. Texas state wheat ratings out with winter wheat G/E ratings at 27% vs 48% in November, fair 52% vs 36%, P/VP 21% vs 16%. Trade estimates for winter wheat acreage average 32.128 mil acres with HRW at 22.579. 2018’s final plantings were at 32.535 mil acres. USDA report is out Friday 2/8 and will include Dec quarterly stocks, final fall harvest production yield, January delayed reports, and wheat planting intentions. Today’s chart shows absolute global ending stocks of corn, soybeans, and wheat over the last 15 years, including aver-age trade estimates for 2018/19 in Friday’s upcoming S&D update. 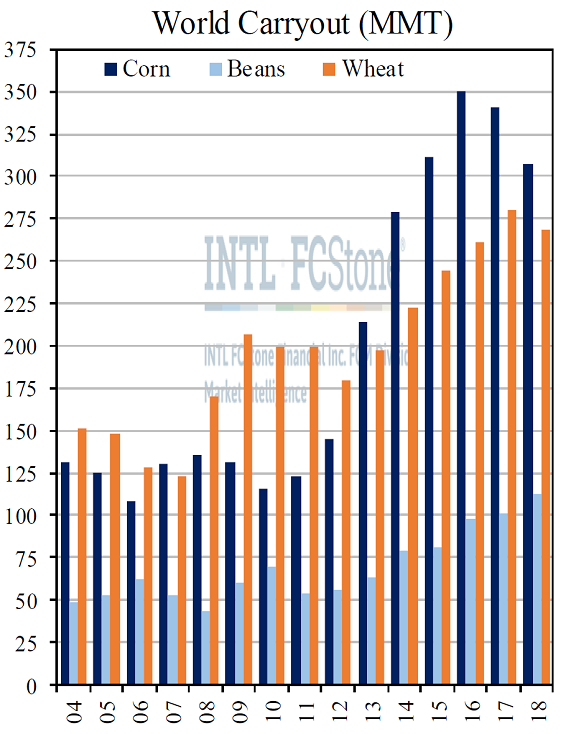 The market is looking for lower U.S. carryout and Brazilian production to combine for overall reductions in both world corn and soybean stocks compared to Dec, with corn seen down 1.7 MMT and beans –2.6 MMT month-over-month. The former would mark a second straight YoY reduction with the latter still at a seventh straight increase.